It's a buildup as painfully protracted as Cloud Atlas itself. 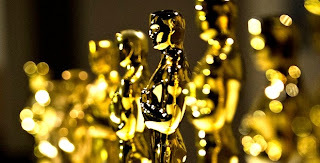 After months and months of Oscar speculation - who'll get nominated, who'll get the shaft - the Academy of Motion Picture Arts and Sciences will finally dole out their 2012 cache of chiseled-chinned, stone-faced statues Sunday night. In case you've been off on a hunting expedition in Siberia, the headline is clearer than Ethanol: Ben Affleck got screwed. Make no mistake about is, his outlandish non-nomination for Best Director is the most preposterous omission in Oscar's 85-year history. More on that to follow. Erick's analysis: With wins at the: Critics' Choice, Golden Globes, PGA (Producers Guild), SAG, DGA (Directors Guild), BAFTA (British film awards) and WGA (Writers Guild), is there any conceivable way Argo doesn't win this? Couple that boot-to-the-throat sweep with Affleck's egregious snub in the Best Director category and you have a situation where there's just one way out of this PR nightmare for the 5,800-ish members of the Academy: Award Argo Best Picture. That's not a sympathy vote, that's the right vote. God forbid if Silver Linings Playbook wins, it would instantly own the title of: "Worst Best Picture Ever". Erick's analysis: Whoever wins Best Director is going to have to live with the fact the award carries a gargantuan asterisk with it thanks to Affleck's snubbing. So what's happened since the side-splitting shunning? The Boston native brought home every available best director trophy on the road to Oscar including the Directors Guild's Outstanding Directorial Achievement in Feature Film award, a massive medallion handed out by a guild comprised solely of folks who make the movies we see – the ultimate redemption. As it is, Steven Spielberg is the favorite to win his third Best Director Oscar but don't count out Ang Lee or even Benh Zeitlin for his artistic - and nauseating - portrait of post-Katrina Louisiana. If David O. Russell wins, my faith in humanity will cease to exist. Erick's analysis: This is as close as we come to a mortal lock at the Oscars. While Lincoln the film has whiffed on the road to Oscar, its 16th president hasn't. Like Affleck, Day-Lewis has swept all the major awards and his winning streak won't be coming to an end Sunday night. Only Jackman has an outside shot of winning, the Aussie's beloved in Hollywood and he killed it hosting the Oscars in '08. After all, when is Jackman going to be in another film worthy of an Oscar? Erick's analysis: Right behind Best Supporting Actor as the most in-question category. While she's by no means my fave, Lawrence has emerged as the slight frontrunner. But Chastain is right there with Katniss Everdeen as both starlets shoot for the first of what may likely be multiple Oscars in their sure-to-be-lengthy film careers. Don't sleep on Riva though, she's Amour's centerpiece and my pick for the finest female performance of 2012. Erick's analysis: This could go to any of the five nominees – it's that wide open. To give you some idea of the strength of field, each of the quintet has an Oscar to his name. While my best guess is to go with SAG Award-winner Jones, the sentimental vote may flow De Niro or even Arkin's way. Then again, Waltz won the Golden Globe and Hoffman the Critics' Choice. Bottom line: Don't bet the house on any of the five. Erick's analysis: Second biggest lock of the night. While Hathaway's stream of semi-scatterbrained speeches - specifically her BAFTA's acceptance - have been razzed, this is Fantine's to lose. Though Field could score the upset with the Academy's prevalence of older voters.